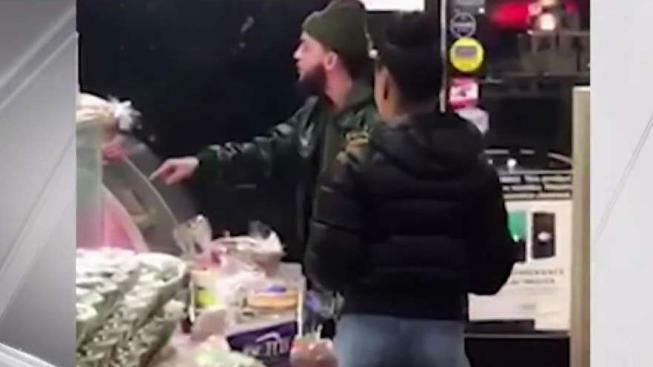 The customer at the Hi Mango Flushing Avenue Deli in Bushwick demanded his order of a bacon, egg and cheese on a toasted cinnamon raisin bagel "right NOW" at around 4:30 a.m. on Sunday, Nov. 25, according to cellphone video provided by deli workers. "Make my cinnamon raisin toasted bagel with bacon, egg and cheese RIGHT NOW," the customer shouted, banging on the deli display case. "Right f---king now! Make my s--t right now!" Patel told News 4 New York on Wednesday, "He just kept throwing stuff at my head," including a bag of bread, a computer tablet, a metal stand lying on the counter and a hand basket. But it's what Patel heard the man say that still gives him nightmares. "When I sleep, nighttime, I still dream it, because he told me, too, 'I'm going to shoot you,'" said Patel. "He told me he gonna shoot me." Patel said the man hopped into a waiting car with two other men after Patel called police. He was treated for bruises at the hospital, but said he's still scared to come to work, not knowing if the customer will come back.